Today is the first day of April, such a glad little month. We have high hopes for this month don't we, hopes of blue skies and glorious spring moments. March you have been such a chilly month. And today is a good day to introduce you to my new creative assistant, Conchetta Conchetta, who has come to help me in my shop at 'my little red suitcase'. She has travelled all the way from the far flung corners of Europe, where she lives in a little wooden house among the wildflowers, in the mountains with a view of the sea. 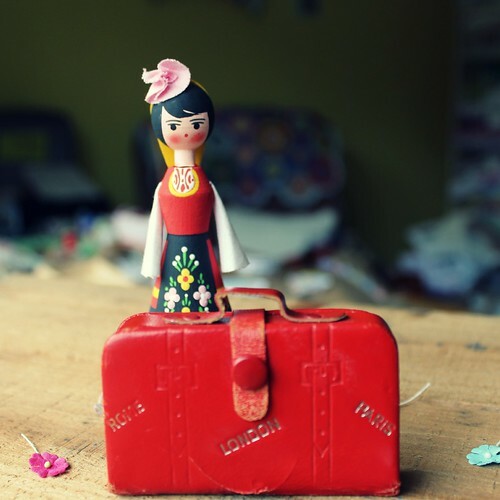 In her suitcase she carries, her sewing kit and scissors, her tin of travel sweets, a note book and a pen, some postcards, her little embroidery table cloth, a fine china cup and plate, her favourite crochet shawl, an acorn, a shell and one and a half socks. Conchetta Conchetta when she ran away to Spain. 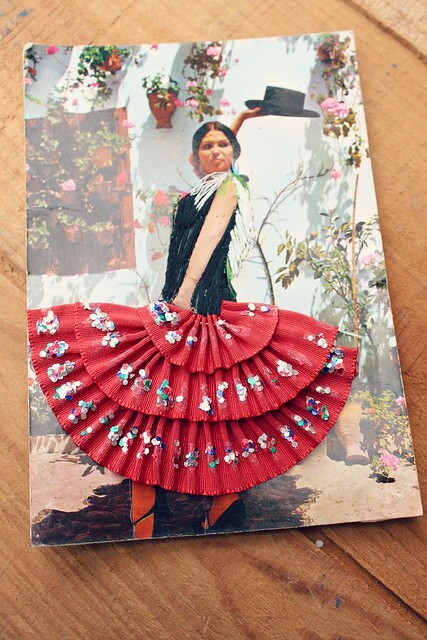 When she was younger she ran away to Spain, where she had a brief career as a flamenco dancer. Sadly she found the heels a little too uncomfortable, the castanets a little too loud and she worried about the plight of the sorrowful donkeys. She was happy to have had this adventure though and felt she had been a little bit bold and a little bit risqué. In the mountains at the orphanage where she worked she was in charge of stitching and mending and many a little one ran around wearing one of her little patches on their trousers, or flowers on their pocket.You could usually find her with her needlework, reading an adventure book or two. One day she feels she will probably live by the sea and rescue faithful old donkeys from a terrible plight. She hums as she works and has a habit of making lists of things you said you would do and then reminding you that you had not done them. When she's cross she tut tuts, clicks her heels and occasionally stamps her feet. She found her way here because she too is rather fond of vintage suitcases. She considers herself to be a little bit folk and a little bit vintage, and in her most artful and flamboyant moments a little bit la boheme. It's been quiet in my creative workspace and I am so glad she is here. Adorable! Will we see more adventures of our dear Conchetta?? Ola Conchetta! I hope to hear more of your adventures. I like the sound of Conchetta. I think she could be fun! Hermosa Conchetta con su pequeña maleta roja! Conchetta is clearly a woman of many depths. I do like her sense of adventure and her feeling for other beings. Happy April - and she is super cute! Brilliant story. Put a great big smile on my face on this bleak grey day. Has she lost half a sock, or not knitted it yet? Conchetta, if you travel with knitting you're my kind of gal! I'm still waiting for the sunshine! :) It's definitely April showers over here .. but we do have the lovely flowers so chins are up!